Whenever you are working with a new project, new yarn, or anything, it is usually very helpful to make a gauge. This lets you know if your stitches are on track and the size that they are supposed to be. If a pattern says that your gauge should be 4" x 4" after a 10 x 10 stitch count, then it should be. If you get a gauge that is 5" x 5" it could throw off your whole pattern. If your gauge is smaller or larger than it is supposed to be, it's not that you are a bad crocheter, it is just that either your yarn is a slightly less (or more) bulky variety than they used in the pattern, or perhaps you crochet looser or tighter than the person who wrote the pattern. So, on to how to make a gauge. Example of a square gauge. "Rnds 1 and 2 of Motif C = 4 in. (10 cm) BE SURE TO CHECK YOUR GAUGE. When you match the gauge in a pattern, your project will be the size specified in the pattern and the materials specified in the pattern will be sufficient. If it takes you fewer stitches and rows to make a 4 in. 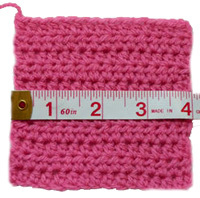 [10 cm] square, try using a smaller size hook or needles; if more stitches and rows, try a larger size hook or needles." Now, this is for a pattern worked in the round, which we haven't gotten to yet, but all the gauges pretty much work the same. This particular pattern is telling us that if you do the first and second round of the pattern for Motif C, it should equal 4". It even tells you what to do if it isn't! Now, if you take the small moment that it takes to make the first two rounds of motif C before you start, then you'll know if your pattern will work and turn out to be the correct size or not. "Gauge: Each motif measures 4 inches square." From a granny quilt, where the gauge is even helping you move further along in your pattern. "24 sts = 4”; 13 rows = 4” in Pat St." This one is telling you that 24 stitches across and 13 rows should be equal to a 4" x 4" square. This one is for a large blanket, and making that four inch sample before you start will ensure a nice piece. "4 sts = 1 inch; row gauge is not important." With this one, they're telling you that the width is the only thing that matters, not the height. As you can tell, there are many ways of wording a gauge, but each one explains a great deal about how the project will work up and lay. Save yourself time in the long run, and make a gauge today!